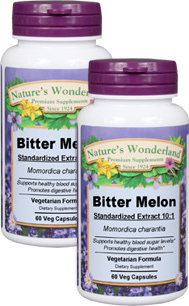 Bitter Melon Standardized Extract - 550 mg, 60 Veg Capsules each (Nature's Wonderland) - Penn Herb Co. Ltd.
Get all the concentrated power of our standardized Bitter Melon Extract. It's used primarily by millions all over the world as a part of their alternative program for healthy carbohydrate and glucose metabolism. Bitter Melon grows on a tropical vine related to the squash family. Like many bitter herbs and foods, Bitter Melon beneficially affects liver and digestive system health. For maximum benefits, herbal practitioners recommend taking Bitter Melon together with the "sugar destroyer" herb, Gymnema. COMMON NAMES: Ampalaya (Phillipines), Bitter Cucumber, Bitter Gourd, Cerasee, Fu Kwa (China) Karela, Sorci, Sorossie. Promotes digestion (bitter taste stimulates digestive juices); support liver functions. As a dietary supplement, take 1 Capsule three times daily with water at mealtimes. CONSULT A HEALTHCARE PROFESSIONAL BEFORE TAKING THIS PRODUCT IF YOU ARE PREGNANT, NURSING, TAKING INSULIN OR ORAL HYPOGLYCEMIC MEDICATION.